Most alarm clocks only do the bare minimum required of them: they tell the time and wake you up. The Clockee Talkee goes a few steps further and adds communication to its list of abilities. 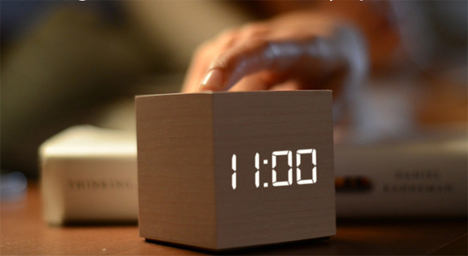 The Clockee Talkee from Milad Modir is half alarm clock, half intercom system. In a home or business where communication between different parts of a building is necessary, shouting or running over to the other party aren’t always the best possible ways to spread a message. The Clockee Talkee acts like an intercom without complex wiring or the expense of a whole intercom system. 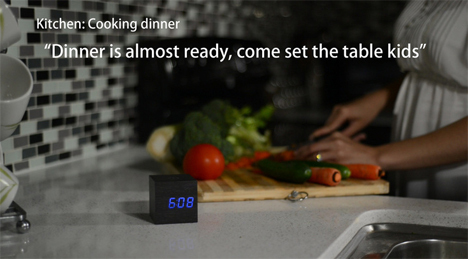 The little cube features an LED display, a speaker, microphone, and even a thermometer. A small button on top lets one user communicate with another up to .6 miles (1 kilometer) away. Voices are converted into radio waves and transmitted via open field communication. To activate the thermometer, one only needs to clap. The clock will display the time and temperature in either celsius and fahrenheit. The Clockee Talkee can be used on the go with three AAA batteries, letting you take the simple modern design anywhere you please. See more in Clocks & Watches or under Gadgets. November, 2013.